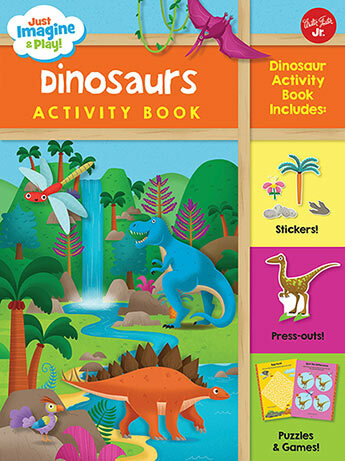 Roar back to a time when dinosaurs roamed the Earth in this 48-page activity book with puzzles, games, a fold-out backdrop, and more for hours of prehistoric fun! Kids will discover a fold-out play scene, reusable stickers, and press-out, stand-up dinosaurs to customize their own adventure in this awesome book! Create your own dino-riffic world with Velociraptors, Pterodactyls, and a Tyrannosaurus Rex, plus prehistoric plants and other creatures. Explore puzzles, games, and fun facts all about dinos in this 48-page activity book, filled with mazes, quizzes, drawing, coloring, and more. Its an adventurous way to visit a mysterious world and walk among the dinosaurs! Mattia Cerato has illustrated many books including Sticker, Punch-out & Play! : Construction; Sticker, Punch-out & Play! : Dinosaurs; and Just Imagine & Play: On the Site. He resides in Turin, Italy.